This is a very simple way to decorate with style but not take too much time. I used Christmas cookie cutters to cut the trees. 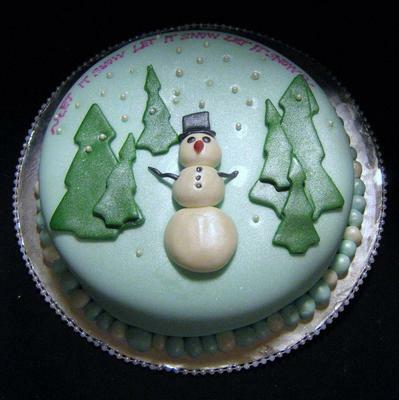 The snowman is just rolled balls of fondant, flattened on the back side by pushing down a bit on the counter. The snowman's hat is cut out and the arms are rolled black fondant to look like twigs. The carrot nose is a bit of orange fondant rolled into a cone and scratched with a toothpick. The "snowballs" are made with little sugar pearls and pressed into the fondant. If I did this again I would just use gum glue or royal to glue them rather than pressing in. Then I used an edible food marker to write "Let It Snow, Let it Snow, Let it Snow" across the top. The border is fondant rolled into little balls. Sprayed the whole thing with shimmer spray from the airbrush. This entire cake took less than 20 minutes to decorate so it's a nice technique to use for quick and easy decorating with a professional look. Return to December, 2012 Cake Decorating Contest Submission Form.